Cristina Villalba Lázaro (1966) was born in Madrid and raised on the Spanish island of Mallorca. With the baggage of her father's creativity all in her genes, she had late last century to end the happiness in the studio of Alceu Ribeiro in the center of Palma de Mallorca. As a former student of the Uruguayan artist and pioneer Torres Garcia Ribeiro provided the knowledge, inspiration and self-confidence which is the basis today of Cristina's work. And also explains the versatility that characterizes her portfolio. Meanwhile, Cristina works from 2005 independent from the Netherlands. 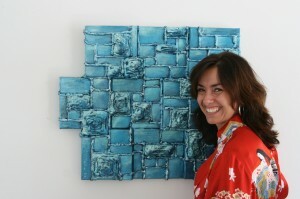 In her studio, the artist works undiminished passion for the development of her diverse portfolio. Which she herself is her biggest critic, with a healthy drive for perfection. Although her work is mostly modern and experimental, initially with great attention and interest in constructivism, her work also has special portrait paintings. Meanwhile, its portfolio with striking paintings, which are characterized by exuberance in color and size. Always seeking balance, equilibrium and "rhythm". And always looking for a new challenge. Although Cristina her inspiration and creativity can live optimally in her own productions, she also works with pleasure on assignments. The idea behind the work Cristina Villalba recent years is the belief that products and materials in different ways and for different purposes can be used or reused. Unlimited . If you long enough to think and experiment . Wholly appropriate in the current zeitgeist . This idea has led to works in which the most diverse materials and products are used . Since 2011, Cristina focuses on the use of aluminum cups and the use of different types of paper in her work. I have lots of material and color knowledge gained through years of both two- and three - dimensional work . I am fascinated by the effects of color and material, and the depth and strength in particular can emit the three - dimensional work. The challenge to make this in the plane has resulted in this series. They are printing photos so pure without digital processing. VAK (Association Amstelland Art ) In Amstelveen, Holland. Association of visual artists from the Balearic Islands AAVIB (Associació d'artistes visuals de les Illes Balears).